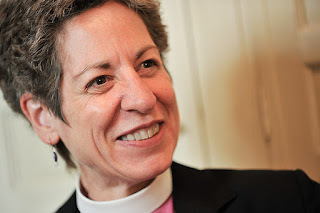 We broke the news last week that Former Presiding Bishop Katharine Jefferts Schori will be headlining as our Keynote Speaker at the VGEC 2016 Annual Conference in Spokane. Since this announcement, we decided to catch everyone up on the latest from the sure-to-be stellar Spokane conference. The Very Rev. Bill Ellis, Cathedral Dean, will be speaking at a session on Friday regarding the history of the founding and building of St. John's Cathedral, the only English Gothic building in North American built during one generation. Bill Ellis is a historian by education and is looking forward to providing an interesting multi-media presentation. Dallas wants everyone to rest assured that his team will provide reduced fare shuttle van service between the airport and hotel on Thursday, Friday, and Sunday. Pick up times will be based on flight and arrival times provided by vergers wishing to utilize this service. Final arrangements are still being made, so keep on the lookout for more details. Vergers who wish to put on the ritz and rent a formal suit or tux at a specially arranged reduced price for the Saturday evening banquet can do so by contacting Mr. Tux with your size and other measurements. A tux will be ready for you Saturday afternoon for pick up right across the street from the hotel. Go to www.mr-tux.com or call them to place your order at (800) 678-8948. Be sure to let them know you are with the VGEC. For those who enjoy exploring Spokane, there will be some free time during the weekend to explore downtown Spokane and some of its award winning wineries as well as the resort town of Coeur d'Alene Idaho. Detailed options will be provided. There will be some live musical entertainment during the weekend which will be a surprise to conference attendees. You won't want to miss it! Finally, we will offer plenty of good quality nutritious food and snack options during the conference with selections available for those with dietary restrictions and food allergies. Breakfast and snack items, coffee tea, juice and other beverage choices will be provided every day. Dallas and his team are working on making this the best conference yet! There are still many, many details to come, but we hope that this glimpse into the outstanding work that they're doing will entice you to register now for what will be an unforgettable weekend of prayer, learning, fellowship, and fun. Abstract: 2016 Annual Conference Host Committee Chair Dallas Hawkins shares with the VGEC some of the latest and greatest news from his team's preparations for the upcoming Annual Conference in Spokane. You have shared a wonderful update on this annual conference. I was looking for a good corporate venue Houston for our annual conference in Houston. Really want it to be success and perfectly organized.